For months, I had been hearing constant talk about a new Legacy-type board game—the kind in which, as you progress through the game, certain situations will cause you to permanently mark or alter your board. Each time it caught my attention, I would immediately tune out, as I could never rally behind the idea of a Legacy game. I had heard previous rumors that when Pandemic: Legacy was released, some players were required to tear up cards or destroy or damage the game in other ways. Personally, I wasn’t having it. Once of the biggest factors in owning a game for me (and I know I’m not alone here) is its “replayability” value, or how likely am I going to replay this game, and will it still be as fun? So I pushed the raving talk about Gloomhaven aside and moved on with my life. But then a friend of mine, fellow Twin Cities Geek writer Garrick Dietze, bought a copy of it and offered me a seat in the game. In the name of science—and since it wasn’t my game that would be destroyed—I accepted. I’m glad I was smart enough, or lucky enough, to have agreed, because I absolutely love it. The big box ready to go. Gloomhaven is, in basic terms, strikingly like other dungeon-crawler games. The core setup consists of choosing from the available characters, each with their unique play style, and pushing through predesigned scenarios, each with a planned layout of opponents and treasures, based on the number of players. 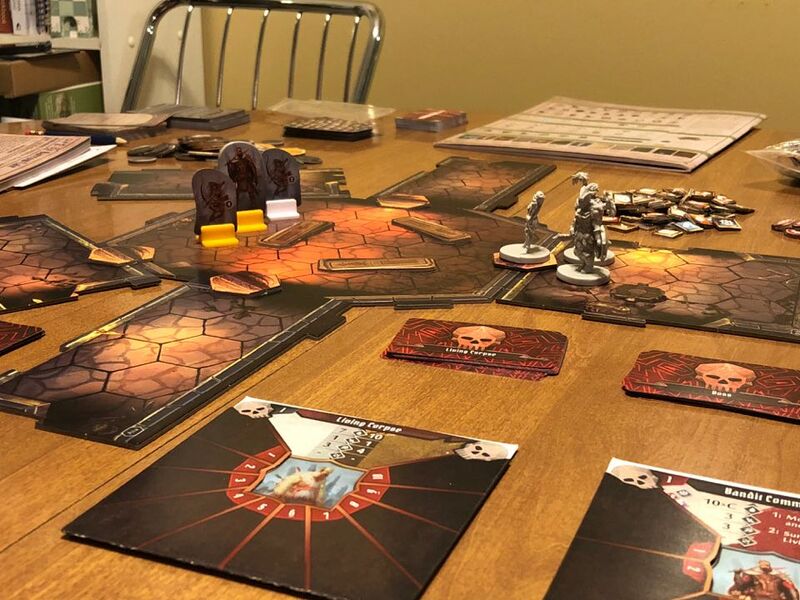 I have played Zombicide and Descent in the past and expected Gloomhaven to be the same: go in, punch a lot of baddies, take their loot, and get the heck outta Dodge. If I were a betting man, I would have lost a lot of money on that assumption. This version of a dungeon crawler requires the players to form a campaign, which will last for a long time—dozens of scenarios can be unlocked in the campaign. At the beginning of a campaign, each person chooses a character. I chose a spellcaster, hoping to hide behind someone who picked a tougher character so I could throw spells at bad guys’ faces until they stopped moving. I was expecting the combat to be easy as well, and again I was wrong. The combat in Gloomhaven is based on a small deck of cards that each player has filled with the actions they can make. Some cards are for offense, some for defense. Each player uses two cards per turn, and then they are placed in their discard pile. If you cannot play two cards, you must rest on your turn, gaining all your discarded cards back to your hand, then putting one in the “lost” pile, from which it cannot be recovered. If a player cannot play two cards or recover cards to be able to play two cards (or if they lose all their health), they become exhausted and leave the session. Some cards are so strong, they are immediately sent to the “lost” pile after use instead of the discard pile. In the case of my spellcaster, a lot of my cards could only be used once. Thankfully, my character, whom I named Pom-Pom, could recover all of her lost cards, but I could only use that trick one time—the card allowing me to do that itself went to the lost pile after play. Because of this, I quickly learned that I needed to manage my cards wisely or I would burn out before completing the quest. This required a serious amount of thought to balance the right spells to make a big impact in the game and still make it to the end for later sessions. I was relieved to find that the first quest in our campaign was manageable. We beat the big bad guy and all the little ones too, and we reaped our rewards. When the quest was complete, we returned to the titular city of Gloomhaven and turned in our mission. The common trend for completing quests was our group being presented more choices that unlock more quests based on our decisions. I recently finished my third quest in this game, and I am still itching for more. 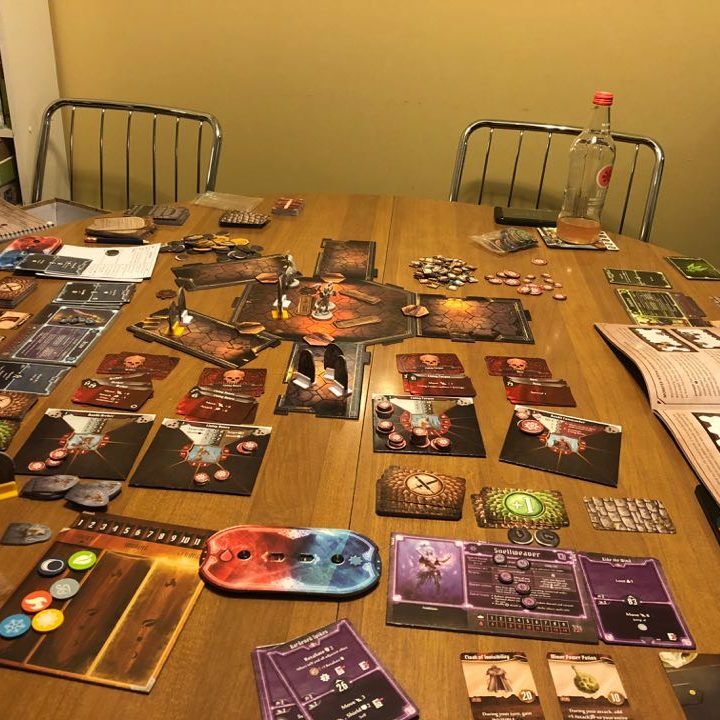 Although not entirely revolutionary in the dungeon-crawling world, Gloomhaven offered much more to me than just simple entertainment with friends. I came to really appreciate the value of Legacy games. When we returned to town after a completed mission, our reputation increased, which was marked on the map; when a new location is unlocked on the map, a sticker is placed on the map to reveal the location. Legacy games really strike home the idea that your actions matter, no matter how big or small. I love being able to see the progress we make, and how it changes the world around us. Although this game is forever changed by how we play, and it might likely have a conclusive end, with nearly 100 different possible missions, I can hardly worry about not being able to replay this game enough. 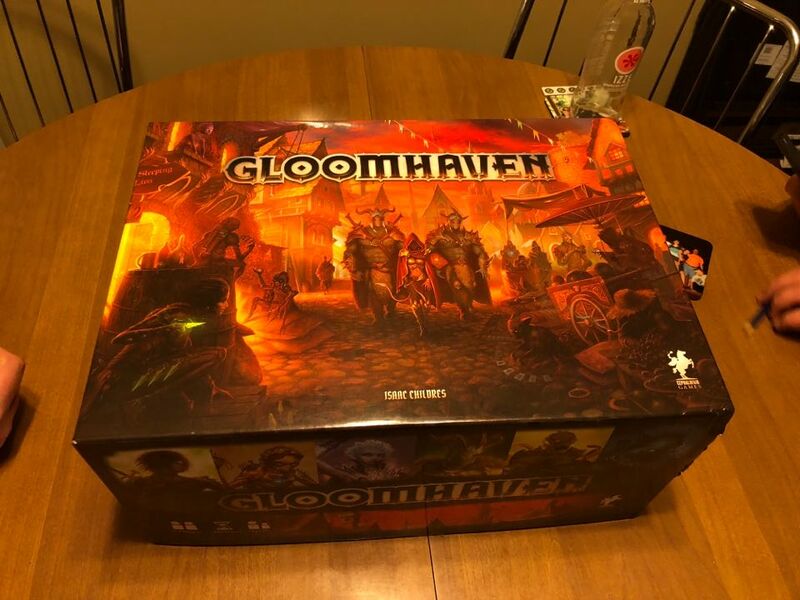 Gloomhaven retails for $140.00, and despite this daunting price tag, it still moves quickly off the shelves! If you are lucky, you can find it on sale. Garrick also purchased a custom insert for the box that works miracles in terms of sorting, setup, and teardown of the game, which I would highly recommend. This game is well worth the investment required to bring it home, but buyer beware: it is not for the faint of heart. Only the most dedicated party can traverse the beast in the box. If you think you are brave enough, I’ll see you in Gloomhaven! I personally enjoy Hero Quest more… but everyone has their faves. I agree wholeheartedly about the ‘replay-ability’ aspect of legacy games. However, from what I understand, Gloomhaven is quite a long campaign. So, you get a lot of play out of one edition. I have played both Pandemics and so have played over 30 games, just of legacy. I think I am fine not playing it again, not in a bad way, but if it went OOP tomorrow, I wouldn’t rush out to grab a copy. interesting article, because I played the exact same character in my first game of Gloomhaven and it led me to realize that the game isn’t for me. I don’t feel the characters are balanced, or maybe balanced in a D&D 3.0 sort of way. Also, the co-op aspect is pretty weak. Once the money drops, it is every hero for themselves (at least in my group).